STORM CHASE... 4 CORNERS, MONUMENT VALLEY AND THE GRAND CANYON. 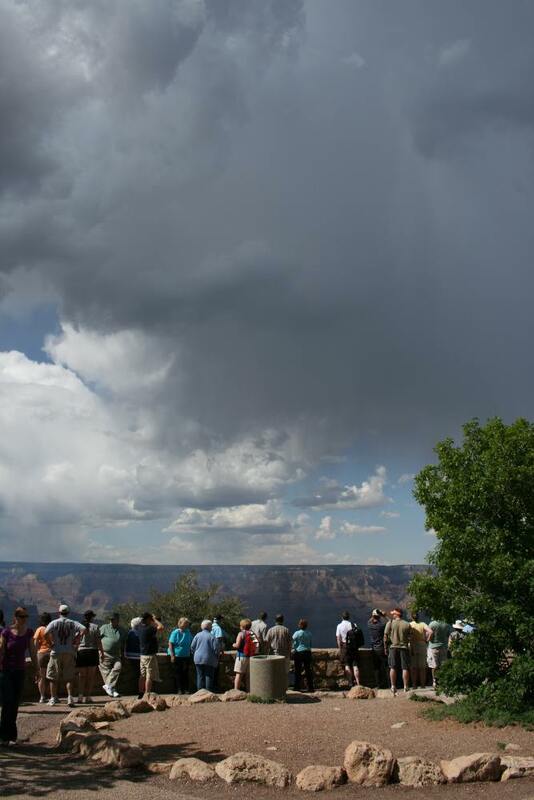 By mid morning we were arriving at the 4 Corners reserve - this where you can balance on one big toe and be in 4 states at the same time, not a bad trick....The states are New Mexico/Utah/Colorado and Arizona. The area is run by the local Indians and there are numerous stalls selling mainly Indian hand made jewellery...all high quality...there are no pushy sales people here, whether you buy or not they will greet you with a genuine smile and I saw similar necklaces to what I bought in the Cortez WalMart carpark and for 15 to 20 dollars!. These Indians are honest people and they will make any sort of jewellery right in front of you in what ever colour mineral stone...Dont be afraid to buy here. We had been watching all morning a developing multicell storm to our north, a splendid backdrop of a brilliant white anvil and the red semi arid country. 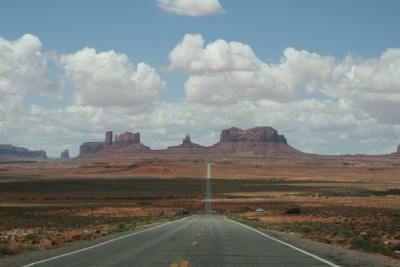 By midday we were approaching Monument Valley, I recall my kid days and watching cowboys and Indian movies at the theatre...this is that sort of country...but nothing will compare to the vista you get when you line up some of the incredible geology of this part of America...No photo will do it justice, you stand there and gape... truly magnificent.....Mexican Hat is a small settlement on Hway163...It was run by Indians, the reason it's called Mexican Hat is a weird rock formation near the town...which looks like ...a Mexican Hat !. 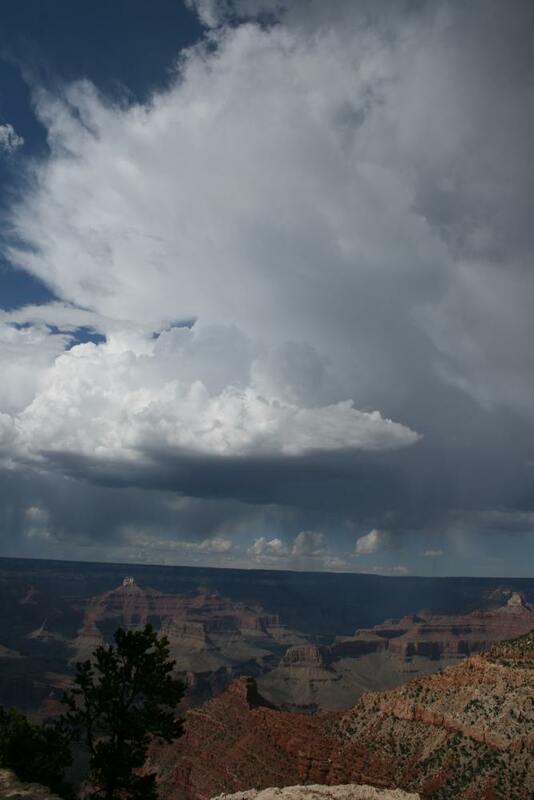 Meanwhile convection was kicking along and deep cumulus were spreading across the sky, the Arizona monsoon had arrived in late May and not July as normal. Storms were breaking out all through the '4 Corners' regions. 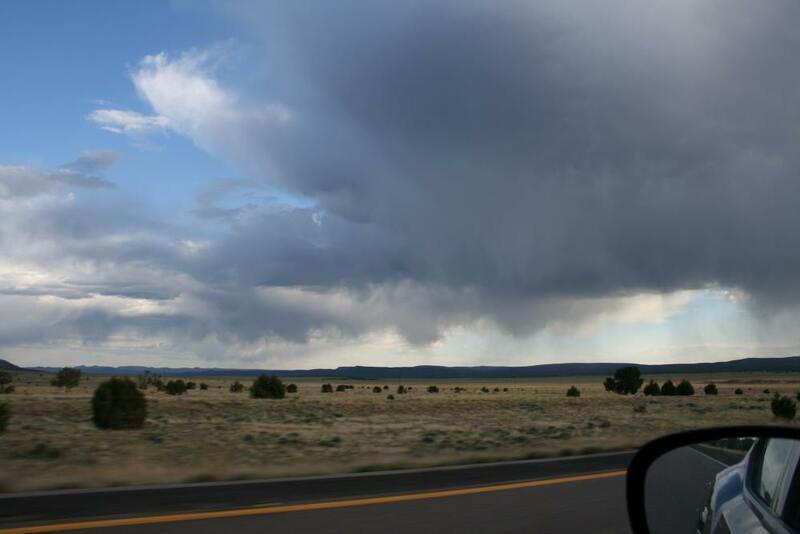 This country offers different storms to the mid west and great plains - they are high based and produce the most memorable appearances with trailing precipitation trails and fantastic mammatus features. We trundle on through the best of Monument Valley with spectacular pinnacles and buttes, eventually we arrive in an area called the Painted Desert complete with dust devils, nothing grows on the strange sedimentary soil but the region offers a fantastic deal with colours, you also get a good indication of what Mars is like. 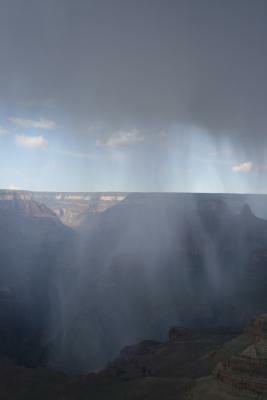 Within one hour the original storm had expanded. 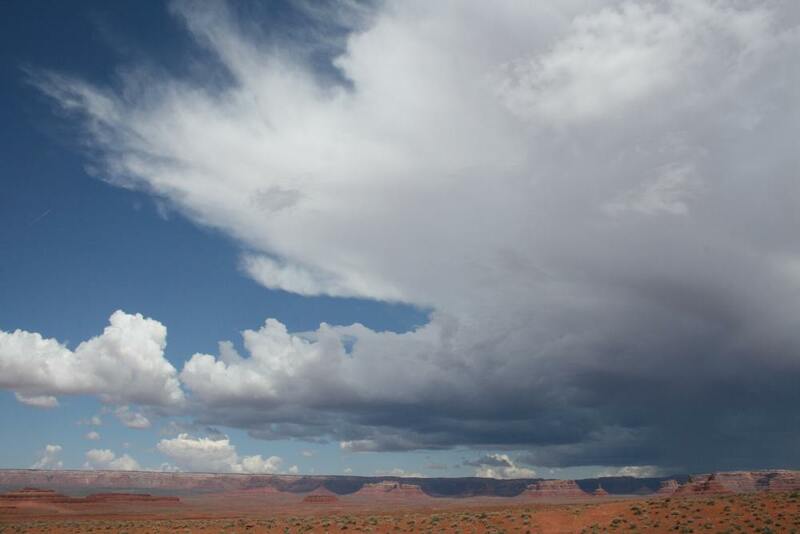 MEXICAN HAT region Utah. 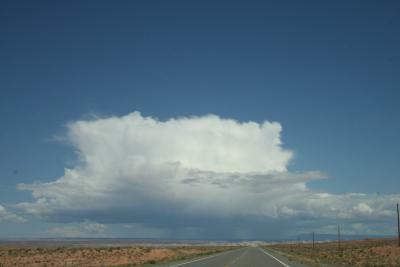 Cumulus developing over the lower plains (5000 feet) showing the reflective red bases. 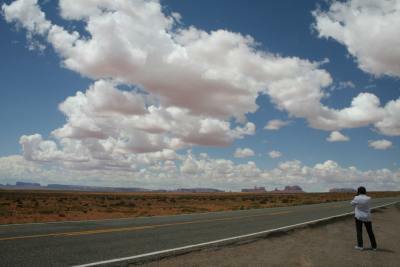 The road to Monument Valley...you dont need a key. The decaying tendrils of a weak storm Grand Canyon, the snow line appears low but the reality is you are more than 7000 feet above sea level. 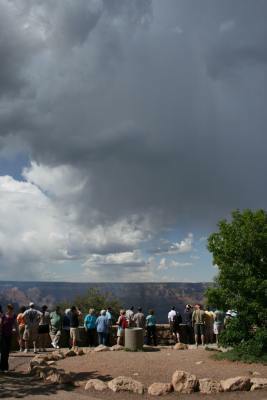 The tourists appear everywhere..they scattered after this image was taken after a triple lightning bolt zaps across the chasm. A larger storm develops on the north rim. 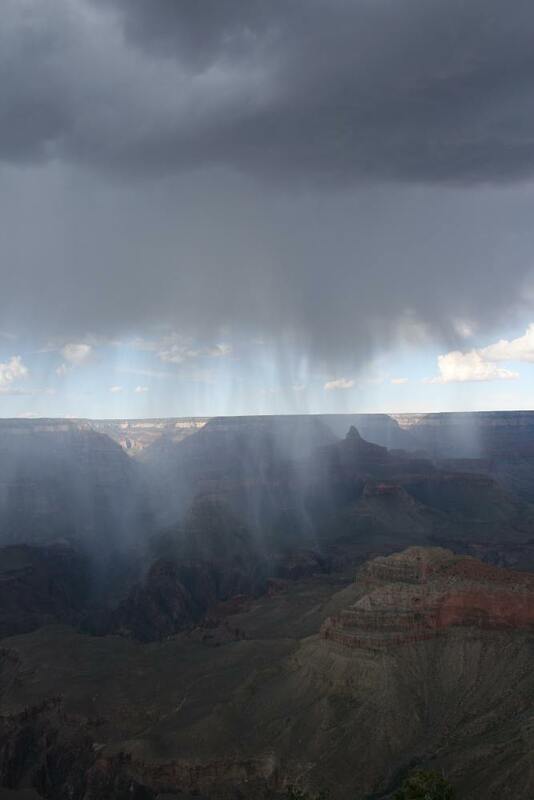 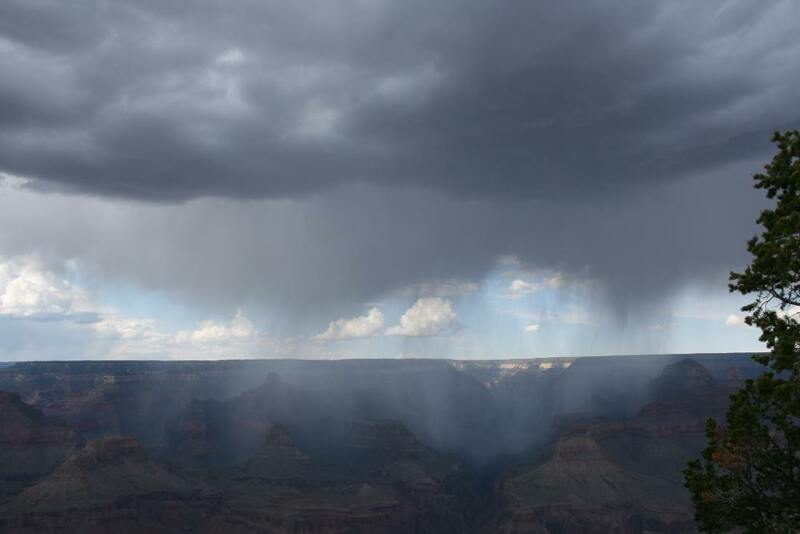 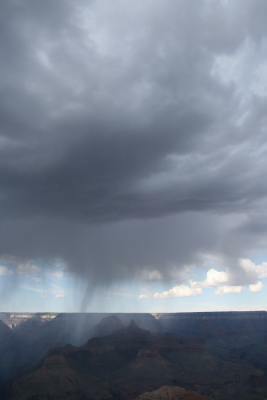 A delightful rain curtain spreads across the Canyon drifting southward off the north rim. 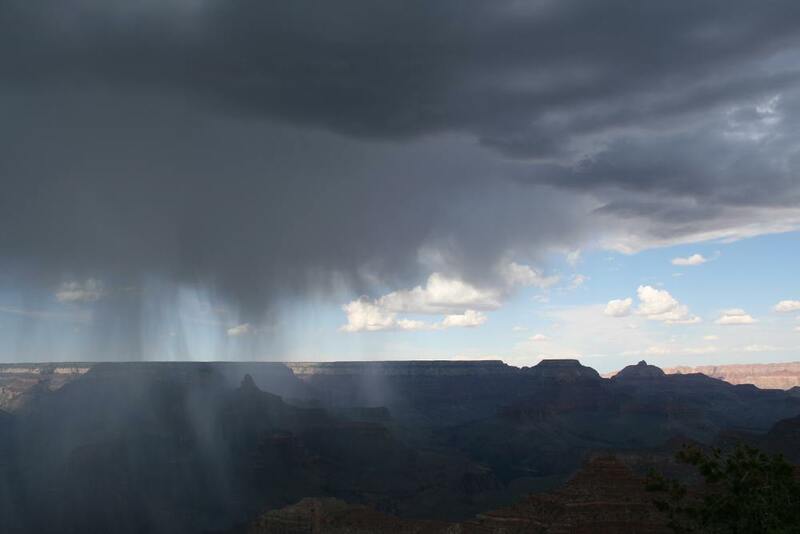 A narrow shaft of rain takes on the appearance of a false funnel. 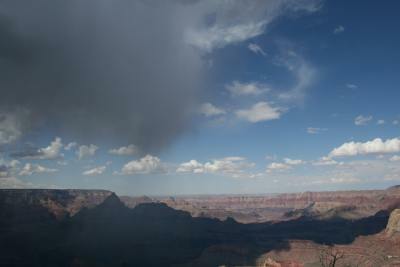 The Canyon floor is more than a mile below the south Rim. The detail of the falling rain shafts was spectacular. The deluge makes it to the near south rim of the Canyon.